By Andrew Barnett, partner and head of the SEO practice at digital marketing and public relations firm Elasticity. Organizational structures are notoriously rigid, often lacking the agility and flexibility to respond to changing market forces. Over the last decade, the unrelenting growth of digital media has upended the way organizations and brands manage reputation issues and reach audiences, unleashing a tidal wave of new roles, responsibilities and budgets. In the world of search engine optimization (SEO) -- the art and science of getting to the top of the search results (presumably for the right reasons) and perhaps the most undervalued yet most important element of reputation -- change has been constant. But not all organizations have adapted to the changing whims of Google. And this has created a gaping void between what Google wants and how some organizations are structured. The misconceptions about SEO go something like this: SEO is all about the left-brain. It's ruled by spreadsheets, meticulously constructed formulas to evaluate the almighty keyword, and technical changes to the code of the site -- a plugin will take care of most of that. Sure, you need backlinks, but those are just waiting behind some Google voodoo magic curtain ready to be harvested. But, that couldn't be farther from the truth. Nevertheless, I imagine that is the reasoning why SEO at some organizations is still under the control of the code jockeys that develop and maintain their website. In an era where Google rewards sites that deliver content and a great experience to their users, the gap between what Google wants in 2014 and what IT departments can deliver is growing wider. 1. Focus on Users: Build a great website, focusing on users, not search engines. 2. Avoid Manipulation: Avoid tricks intended to improve search rankings. 3. Create Great Content: Develop original content focused on your audience. 4. Profit! : Users will find your content and magically flock to your site. 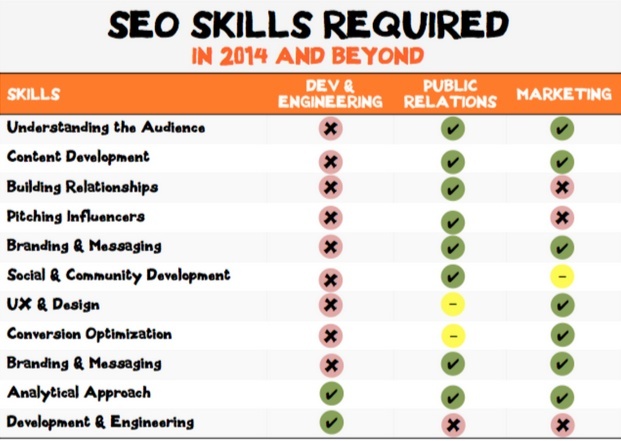 At a high-level, a modern approach to SEO requires a diverse set of skills (above). Across those 11 factors, public relations and marketing clearly are aligned to take ownership of SEO. While development, engineering, and the strong analytical minds of the website managers will remain a vital part of SEO, in the post-Panda world, the demands from Google for organizations and brands to develop even more valuable content and leverage relationships is taking on an increasingly central role. Thus, it's time to let go of the old ways. It's time for IT to hand over the reigns of SEO to those tasked with managing reputation and driving sales through digital marketing channels. In short, those who are better-equipped to manage these new challenges. There's a huge quality mismatch between content created for SEO purposes, and human edited content. With an explosion of content marketing -- it is vital to understand the difference.